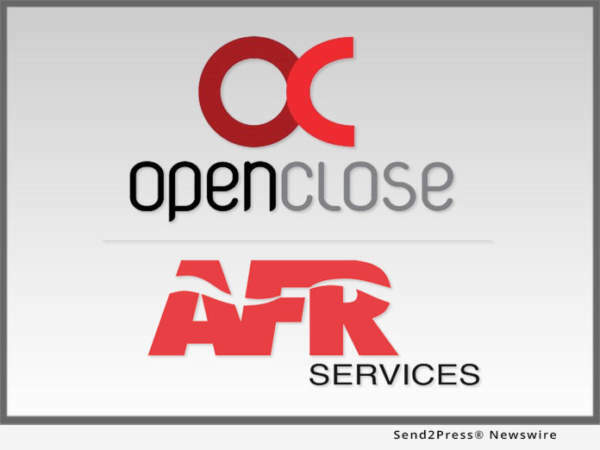 WEST PALM BEACH, Fla., Dec 13, 2017 (SEND2PRESS NEWSWIRE) — OpenClose(R), a multi-channel loan origination system (LOS) and mortgage software solutions provider, announced that it partnered with AFR Services (AFR) to enable customers to access the company’s complete suite of flood services. Using the interface makes it quick and easy to order AFR’s various flood services directly from within OpenClose’s LenderAssist(TM) LOS. AFR is a nationwide full-service risk management company serving mortgage lenders, insurance agencies as well as consumers. The company has expertise in hazard and flood insurance solutions – tracking and notification systems, lender placed insurance, commercial flood insurance, residential flood insurance, and flood zone determination services. AFR is also a Lloyd’s cover holder for private flood insurance. By way of this seamless integration, all data needed to obtain flood certificates is auto populated from AFR into LenderAssist. This eliminates the need to leave the application, place orders on AFR’s website and then re-key information back into the loan file. As a result, time is saved, errors are reduced, accuracy is enhanced and the overall ordering process becomes more efficient. LenderAssist is an end-to-end LOS that is completely web-based and automates all business channels and workflows from a single lending automation platform. System implementations are configured to flex with lenders’ unique business process, which is managed by OpenClose along with post implementation maintenance and ongoing customer support. Founded in 1999 and headquartered in West Palm Beach, Florida, OpenClose(R) is a leading enterprise-class, multi-channel loan origination system (LOS) mortgage software solutions provider that cost effectively delivers its platform on a software-as-a-service (SaaS) basis. The company provides a variety of 100 percent web-based solutions for lenders, banks, credit unions, and conduit aggregators. OpenClose’s core solution, LenderAssist(TM), is comprehensive loan origination software that is completely engineered by OpenClose using the same code base from the ground up, thus avoiding the problems that often accompany assembling best-of-breed applications or acquiring disparate technologies in an effort to create an end-to-end platform. The company provides lending organizations with full control of their data and creates a truly seamless workflow for complete automation and compliance adherence. For more information, visit https://www.openclose.com/ or call (561) 655-6418. AFR Services, headquartered in Plano, Texas, is a risk management company utilizing leading edge technology and dedicated personnel to deliver services to financial institutions, insurance agencies, and individual consumers nationwide. Since 1992, the mission of AFR has been one of commitment – a commitment to provide innovative and cost effective solutions for our valuable clients. Regardless of the need, AFR’s team of dedicated professionals utilize their vast experience, coupled with cutting edge technology, to develop targeted solutions that enhance efficiency and increase productivity. Satisfaction and success of our clients builds the pathway to the future and AFR is committed to continue leading in the development and provision of risk management tools and solutions for its clients. For more information, visit https://www.afrservices.com/.